Marinated prime lean beef air dried and sliced with a strong chilli bite, coming in a handy 35g snack bag. Also available in 100g bags. 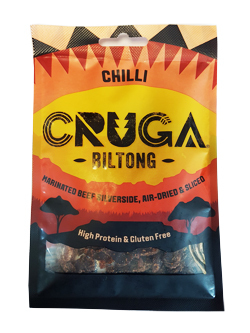 Beef (200g per 100g of Biltong), Seas Salt, Hydrolysed Soya Protein, Caster Sugar, Spices, Yeast Extract, Garlic, Rice Flour, Paprika Extract, Preservative (Potassium Sorbate), Acidity Regulator (Citric Acid).